With the breezy heights of summer upon us, cooking indoors is not something I'm really into. I'd rather picnic in the park, go for a hike, barbecue at a friend's place, drink on the deck ... Whatever, call it a summer diet. 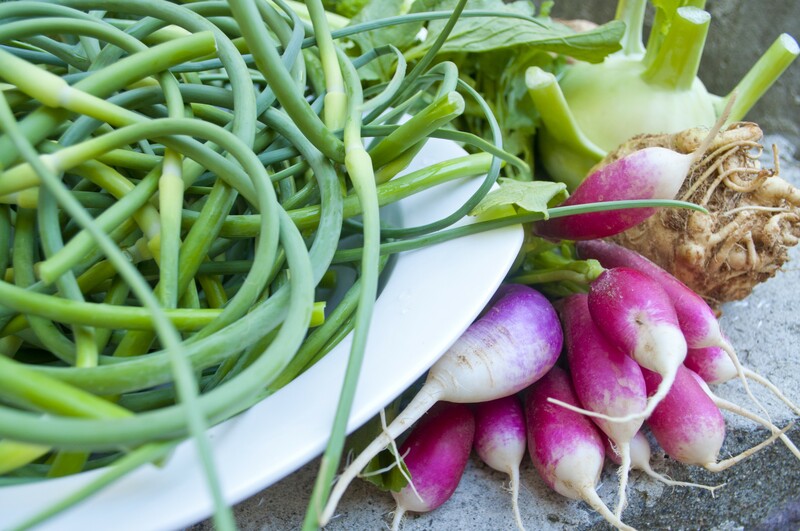 But being a time of seasonal bounty — June vegetables are the crispest, freshest, briskest you'll find all season, Solstice weekend seemed high time to forsake real cooking and preserve a bit of this beautiful midsummer moment. I've been thinking about pickling since Karen Solomon's gorgeous Asian Pickles: Sweet, Sour, Salty, Cured and Fermented Preserves (Ten Speed Press, June 2014) landed on my desk weeks ago. I've been particularly inspired by the Thai-style pickles in that book and in Simple Thai Food, another recent Ten Speed release. This past weekend, Burlington Farmers Market brought a head-spinning array of amazing vegetables; it was hard to keep to a reasonable haul. But I went home with celery root from Full Moon Farm, garlic scapes and French breakfast radishes from Bella Farm, kohlrabi from Pomykala Farm and radicchio and fennel from Digger's Mirth Collective ... And on Sunday night, I pickled most of them and had them over the radicchio as a lazy salad. Not a main course, but an impressive side dish. I like to pickle a few different ways. 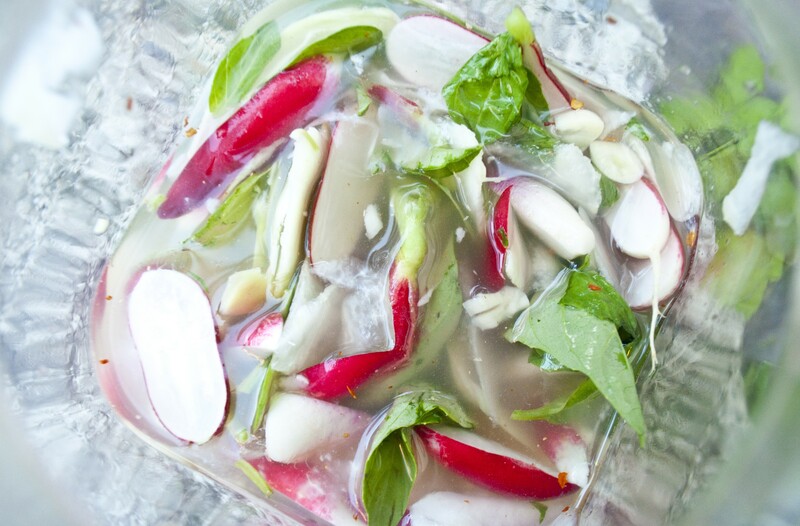 For softer vegetables with high water content (in this case, radish and kohlrabi), I cut the veggies and place them directly in a jar with cold brine. They start to take on flavor immediately, but their character changes as time goes on — within days, pickled radishes stain the brine a lovely shade of pink as their skins fade to white, and everything gets stronger and more pickled. With cold pickles, I like to eat them within a couple weeks, but they'll keep for months and make great fridge-grazing. For firmer vegetables (in this case, garlic scapes and celeriac, which are both quite woody), boil the brine, add the veggies, return to boil, and simmer until veggies start to soften. This can take an hour or more, depending on what you're cooking, so keep checking on them. I boiled my scapes and celeriac for about 45 minutes and they were still quite firm. This simple brine works great for both hot and cold applications. 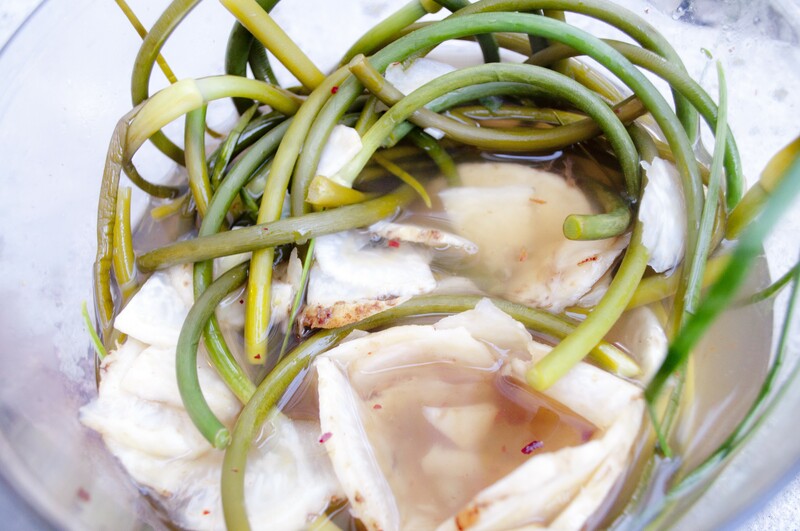 Garlic scapes and celery root hot-brined pickles.